"EPOCHAL...THE DEFINITIVE EXAMPLE OF POETIC REALISM!" When Jean (Jean Gabin), a deserter from the Colonial Army, hitchhikes his way into Le Havre, he’s only looking for a place to hide until he book ship’s passage. He never expects to become embroiled in a dispute between local “tough” guy Lucien (Pierre Brasseur) and wealthy but shady shopkeeper Zabel (Michel Simon). Nor does he expect to fall in love with the beautiful Nelly (Michèle Morgan), who Zabel also “keeps.” What was supposed to be a stopover on his way to a better life turns into a fight against petty jealousies, buried obsessions, and unpleasant pasts. One of Marcel Carné’s most revered films, Port of Shadows explores the foggier aspects of identity, love, and the possibility, or perhaps impossibility, of escape. 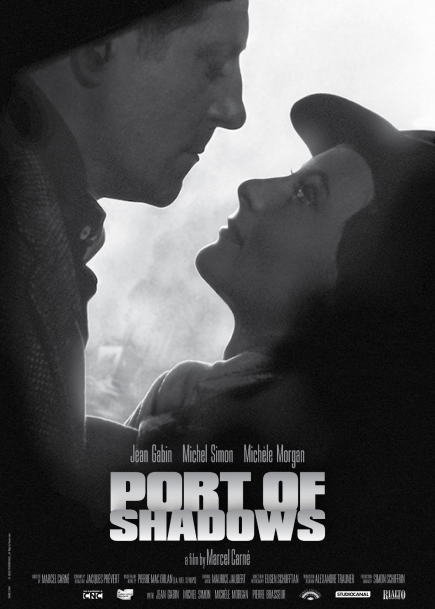 "In 1938, no film looked more revolutionary than Port of Shadows. With its opening scene of bedraggled Jean Gabin struggling down a foggy road, the very temperament of French cinema changed." "I thought that this was a film about life as it really is, and that I had never seen anything like it before."